I have been incorporating civic engagement into my teaching for years. I am so pleased that WWU values this approach, and am very grateful for the infrastructure that supports it, particularly in the work and resources of WWU's Center for Service Learning, its Faculty Fellows Program, and the critical input of the folks there. I believe that service-learning benefits students in both a theoretical and practical way, as they apply what they are learning to a project that has demonstrable benefits. I was involved in the civic journalism movement in the mid 1990s, and continue to place value on the role of journalism in civic engagement. Students in the Department of Journalism's Visual Journalism Sequence have a unique opportunity to apply their writing, video, photo, and web skills to projects that will benefit our greater community at the same time the students create portfolio pieces. Our partners are eager to have our students establish their messages on new platforms, such as Facebook and Twitter, and in doing so, the students position themselves to further their careers in a meaningful way. On the first class day, I make a case for the importance of service-learning, as I've found this facilitates student understanding for why and how we are pursuing this approach. I share information from WWU's Center for Service-Learning, whose motto is: Experience enhances understanding; understanding leads to more effective action. Through service-learning courses, the community becomes a dynamic classroom where learning is integrated with real-world experience. The community classroom becomes a laboratory for challenging assumptions and moving students beyond analysis and observation to practice. Service-learning students gain professional skills and networking opportunities by being placed in off-campus worksites. Our community partners receive the benefit of assistance, and students gain awareness of their community, local concerns, and various ways they can make a difference. 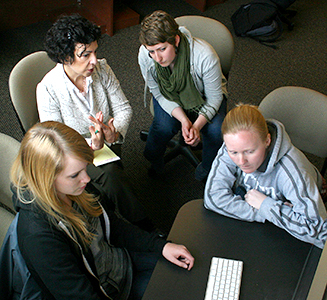 Sheila Webb meets with student teams regularly in her Advanced Visual Journalism class to ensure projects progress smoothly. Service-Learning allows us to extend the curriculum outside the classroom. In the Department of Journalism, we teach both lab and theoretical classes, and this approach allows us to combine them in a way that invests in the community. In our field, the ability to craft, frame, and execute a message is critical, and service-learning allows us and our students to do that. Working with community partners also allows us to model client interactions, thus applying what we do in the class to students progress and future demands. Most important, I believe that up here on the hill, we have much to offer. Service-learning is a way to leverage our skills to benefit our community, something I find both necessary and deeply rewarding. "WWU serves the people of the state and develops the well-being of communities." "Western will build a stronger Washington by active learning, critical thinking, and societal problem solving." Serves as a model for innovation. The Visual Journalism Sequence is relatively new and was designed to address the constant change in the new media environment. 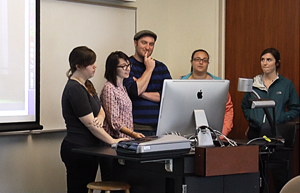 The sequence's capstone class, Advanced Visual Journalism, J446, brings together the concepts students have learned, which they then apply to a service-learning project with a community partner. The heart and soul of J446 is working with community groups to advance their missions via visuals, text, and social media which includes designing brochures, creating videos, and constructing websites. A critical component in this class is the rationale behind service-learning as a way to engage students with the community. Since most of the partners are nonprofit social service organizations, the role of civic responsibility is built into the class. 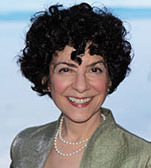 In addition, students do research that places their particular organization and project in the respective field; they analyze similar organizations' visuals to provide necessary commentary and assessment with an eye toward effectiveness; and they produce strategic communication products that embody the organizations' missions and audiences. Student comments reinforce this approach. One student wrote: "I have really enjoyed working with a community partner through the service-learning project. We are not just students at Western anymore, but are actively helping the community. The students also take on a leadership role as they work in teams to advise the community partners on how best to craft their message, and then provide tutorials at the time of hand-off. This aspect of teamwork is a critical component of the 21st century workspace. 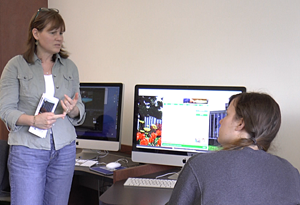 Advanced Visual Journalism students create logos, brochures, videos, and websites for local organizations. See Student Projects for links to example projects. to develop an appreciation for social and civic responsibility, while developing teamwork and leadership skills. Gain an understanding of the steps and procedures needed to create, design, organize, and post a website and/or multimedia / print project for a specific partner and for a targeted audience. 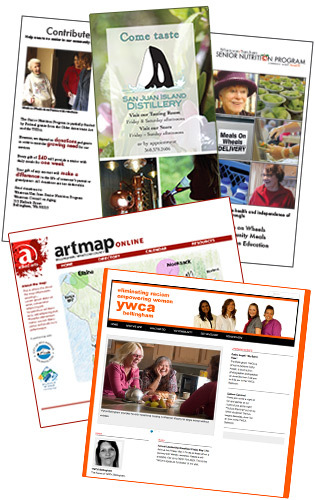 Learn tools to critically examine and critique websites / multimedia. Develop a website / multimedia piece that incorporates several forms of content including text, audio, photographs and takes into account effective site navigation, if applicable. Develop and apply introductory skills in Web design and Photoshop. Develop an understanding of the Internet as a form of communication from practical and theoretical perspectives. Students in Advanced Visual Journalism work with community partners to develop marketing materials. Through service-learning, our students develop an appreciation for social and civic responsibility while developing teamwork and leadership skills. In addition to being able to interact with members of the community, students come away from these projects with portfolio pieces. Thus, they produce not class assignments, but media projects that are really used. Such work is essential in future internships, jobs, or continued schooling. The third most obvious benefit is the experience of framing a message for a particular audience. For example, as much as a team might want to do all the bells and whistles that the Web affords, if the community partner cannot maintain such a website, there is no point in producing it. "Service-learning classes are the best preparation for the 'real world' after graduation. Being able to apply what we've learned to a tangible project is both stressful and rewarding." "I have really enjoyed working with a community partner through the service-learning project. We are not just students at Western anymore, but are actively helping the community." "Although the idea of working for a real-world client was intimidating and challenging at times, there is a true reward in finding out your client's goals and helping to accomplish them." "Seeing the enthusiasm that others have for the skills and services I am able to offer has left me with a determined attitude to find a place in the corporate world where my qualities can be utilized." "This group went above and beyond what was asked and produced a super group of marketing tools! The professionalism and dedication of these students was refreshing and greatly appreciated, and I am very happy with the final product." "Allied Arts really appreciates our WWU Service Learning Partners. They have been a huge asset to our organization this year!" "We would most definitely like to partner again. These students were very professional, experienced and accommodating of our requests. The Community Partners program is a great way to integrate the university with the rest of Whatcom County and provide valuable." "Thanks to all of you for all your work on behalf of Hope House and those we serve everyday. We truly appreciate all of the hard work that you've put into this project." Students in Advanced Visual Journalism present their service-learning project to the rest of the class. The course consists of presentations, readings, class discussions, assignments, in-class work, student presentations, visits by professionals, consultation with the community partner, and completion of a website prototype and/or multimedia story, and/or slide show with audio, or other visual productions identified by the community partner. Class time is devoted to presenting project ideas, learning about the Web and multimedia, developing strategic designs to fit the identified audience, developing information goals, analyzing ongoing projects, sharing tips and techniques and websites/multimedia projects of interest. Considerable class time is devoted to team and community partner meetings. Within the context of service-learning, taking a more seminar-oriented approach and responding to requests of the community partners, the professor serves as a facilitator, editor, guide, and bridge between the team and the community partner. Civic engagement is a compelling concept for academia. This process benefits all involved. WWU serves its mission by making our expertise available. The community partners benefit through the application of our students’ knowledge and skills. Students benefit as they are able to model experiences in the job world at the same time they engage with their community. As we move more and more into an interactive media world, journalism’s ability to reach and to correspond with audiences in new ways is critical. Working with community partners offers students direct experience in crafting a message and getting feedback from stakeholders.